Romance has the power to reclaim a dull soul. It lightens up your life if you find the right ways to hold on to it. There's much written about it for generations now. 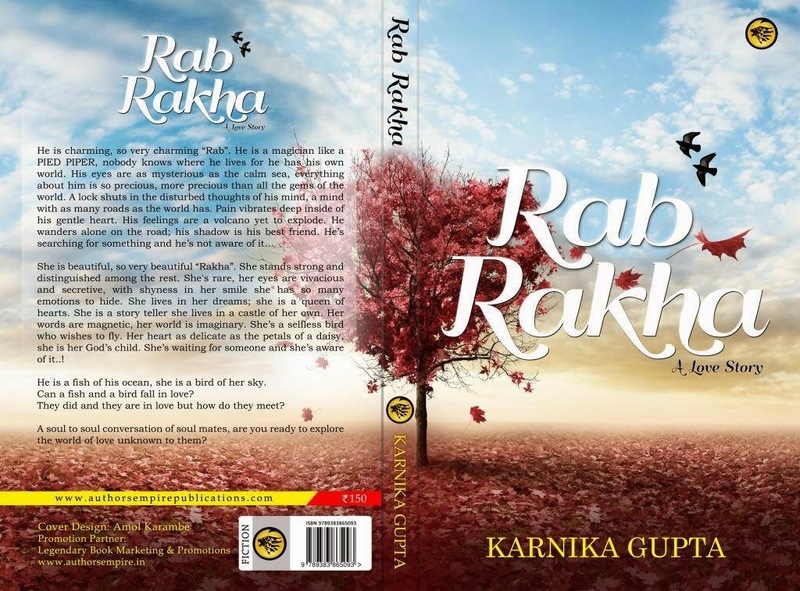 Author Karnika Gupta in her debut offering "Rab Rakha" tries to mesmerise the readers with her enchanted and honey coated words reeking love and spreading the message all around. So does this coating of sugar and spice work it's charm on the readers? Let's find out. He is charming, so very charming-Rab. He is a magician like Pied Piper; nobody knows where he lives, for he has his own world. His feelings are pure; his tears are like pearls in the sea. He is never alone yet he's lonely. He has a heart of gold, but he speaks the truth. He wanders alone on the road; his shadow is his best friend. He's searching for something and he's not aware of it! He is a fish of his ocean; she is a bird of her sky. Can a fish and a bird fall in love? They did and they are in love, but how do they meet? Rab Rakha is a soul-to-soul conversation between the bird and the fish. Are you ready to explore the world of love unknown to both of them? First look at the title and the cover and it looks all desi and divine. The hope through birds, the tree as a lone person and the empty lands portraying plethora of emotions just makes it a picture perfect cover for the book. The title is a salutation from the holy book of Sikhs and nowhere it drops a hint about how it is going to be used in the book which is an added charm for the readers. The blurb talks about two people and their journey and how it ends up being with each other for long. The blurb gives you a little hint of a blossoming love story but it still conceals the apt facts which lie ahead for the readers to decipher. The story starts off with two people Rab & Rakha who end up falling in love with each other. The first hand account of each and every day of their love story has been penned down and how they traverse through a garden of thorns through to the mountains of water and then come back to earth to finish off what started as a game of their destiny. But is it all for real or it's superfluous? Will their love last for eternity or will it wither away like a flower? Is it joy in abundance or sorrow forever? Join them and see it unfold in front of your eyes. The first time you pick up the book it picks you up out of your current state of mind and travels through land of love and despair. Every time an incident is narrated in the book it is done with complete command and the execution is pitch perfect. Every word is heartfelt and every emotion so strong that it makes your heart jump up and down. The book out of the blues with it's uncanny style of narration constantly engages the reader with it's next to perfect conversation and those lovely little nothings when two people are in love. There is minimal characterization which is a big plus and the story churns out the best of romance with realistic effects and makes you comprehend each and every word. Sharpness in the deliverance of emotions attached to live is another feature of the story and the swirling tempo is catchy yet mystic.Simplicity of the book is engaging along with vividness of capturing despair and joy. There is emotion to be felt between lines and there is emotion to be felt with words. The word play is enchanting and optimistic. Even pessimism has been optimized to a certain level of optimism in the story. The only downside of the book are couple of places where repetition of sentences has happened. Apart from that there's nothing else that can be counted as a downside. All in all the book manages to beat the odds and stand tall. In an age where every second book is a romantic saga, this one holds true to it's promise and live up to the expectations. Dull moments are none and the king size modest approach to the story makes it a living experience of a lifetime. Die hard romantics can live and breathe each and every moment in the book as it unfurls. It has the power to strengthen the belief's of love leaving the readers in a state of trance. It makes you crave for more even after it ends. The book is a seamless interpretation of love. A riveting tale of romance.